Largest wren, just a little larger than the house wren, five to six inches long, about four inches upright. Brownish upper, darker finely barred wings and tail. Cream-buff under side and whiter throat. Thin white streak from the beak, over the eye, to the back of the head. Thin, slightly downward curved beak. Typical hunkered down wren stance with upright tail when alerted. Inhabits woodlands, groves, farms and small towns from the southeastern corner of South Dakota, throughout the lower Great Lakes to parts of Maine and from the southern tip of Texas and northeastern Mexico to southern Florida. Nests anywhere about houses and sheds, sometimes on beams, in crevices and in bird houses. Builds bulky nests of leaves, grass and feathers lined with finer grasses and hair often in shady ravines, wooded and rocky banks of streams, in log piles, brush heaps, natural or abandoned tree cavities. Lays around three to six speckled white or pinkish eggs which hatch after about two weeks incubation and young leave the nest in another two weeks. Curious, nervous and almost too quick to notice, it investigates every nook and cranny in foliage, fallen timber and rock mounds in search of insects, seeds and berries. A variety of songs thought to have been imitations gave it the mocking wren nickname. One of the few birds that sings at night. Devoted to mates. The Carolina Wren Birdhouse has a 4″ by 4″ floor, 8″ inside ceiling, 1 1/2″ diameter entrance hole located 6″ above the floor, ventilation openings and hinged roof secured with shutter hooks. Mount or hang from tree limbs at chest level or higher if necessary in secluded locations with partial sun and shade in the vicinity of thick underbrush. Male wrens will build several nests for the female to choose from so hanging several nest boxes may make an area more attractive. 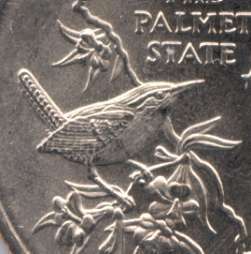 Carolina wrens will also nest on platforms. Other wrens, chickadees, titmice, nuthatches and sparrows may use this box.